When Sani Muntari was 2 years old, he loved to run around and play games with his older siblings and cousins. They lived in Sokoto, a hot, dusty city in northern Nigeria known for its deep Islamic roots. Sometimes, Muntari would go with his mother to the central market where she worked as a trader, peddling everything from vegetables to t-shirts to soap. Then one night, Muntari came down with a fever. A few days later, his parents noticed he was having trouble walking. Soon, he couldn&apos;t move his legs. By the time he saw a doctor, he was paralyzed from the waist down. He was diagnosed with paralytic polio. He was the only person in his extended family of 37 to be affected. During the next few years, Muntari&apos;s leg muscles atrophied and his legs became unnaturally bent beneath his body — a common progression of the disease. He continued to play with his siblings and cousins, but from a seated position. The only way he could get around was to crawl — swinging his lower body between planted hands — or be carried. Then, when he was 6 years old, Muntari&apos;s parents posed a difficult question. "They asked me if I wanted to go to school," Muntari says. They were concerned about how he would be treated by students and teachers. Plus, the school had no disability services. Perhaps, his mother suggested, it would be better to just stay at home. "She told me, &apos;I don&apos;t want you to suffer,&apos;" he says. But Muntari insisted on going. So his parents took turns carrying him the roughly one-mile distance to school. When they couldn&apos;t go, he would crawl along the busy sidewalk, past street vendors and mosques, as motorcycles and taxis whizzed by. When he got a little older, his father — a civil servant — bought him a hand-powered tricycle. "My father really encouraged me to stay in formal education, to become a useful member of society. I&apos;m really happy for that," he says. Muntari says he was rarely, if ever, teased or harassed at school. "I would just be myself, I saw myself as any normal child." If he needed assistance, a friend would help. He eventually finished high school and went to college to become a teacher. Muntari now uses a wheelchair to get around and is a teacher at a school for disabled children, working with blind, deaf and physically impaired students, as well as kids with severe intellectual disabilities. He&apos;s married and has three children, ages 6, 3 and 1. He says his family is happy and healthy. And, on top of that, he&apos;s been an integral part of Nigeria&apos;s effort to eliminate polio — a feat that seems to have been accomplished. Muntari&apos;s home state of Sokoto is the spiritual center of Nigeria&apos;s Muslim population.The current Sultan of Sokoto, Muhammad Saad Abubakar, is considered the head of the country&apos;s roughly 90 million Muslims — half the population. The Sultan and other religious leaders wield enormous influence. Abubakar and others have been key allies in the quest to eradicate polio, making public statements about the importance of getting vaccinated. But some religious leaders, particularly in the conservative northern states, have hindered efforts. Some have claimed the polio vaccine is a Western plot to spread HIV and sterilize Muslim girls. That belief still persists in some areas today. Frustrated by what he saw as a lack of understanding, Muntari decided to join the polio eradication campaign a few years ago. He began traveling with health workers around the city. He would speak with skeptical parents about the dangers of not vaccinating. "I would say, Look at me, this is what can happen if you do not vaccinate your child,&apos;" he says. Most parents, Muntari says, are not close-minded about vaccines. "Many just don&apos;t have the awareness. Some don&apos;t have any reason at all [for not having vaccinated their children.]" Thanks in part to the efforts of survivors like Muntari, Nigeria seems to have turned the corner on polio. Its last recorded case was on July 24, 2014. In September, the World Health Organization officially declared that polio transmission had stopped for the first time in Africa. Dr. Tunji Funsho, the head of Rotary International&apos;s polio efforts in Nigeria, says a lot of things have gone right in the Nigeria campaign — international funding, support from religious and traditional leaders, health organizations working together, and laws being passed that make it illegal in some states not to vaccinate children. But Funsho says there&apos;s no substitute for the involvement of people like Muntari. "People who were victims have been a huge part of the effort," he says. Yet many survivors continue to face stigma, discrimination, and a lack of opportunities. 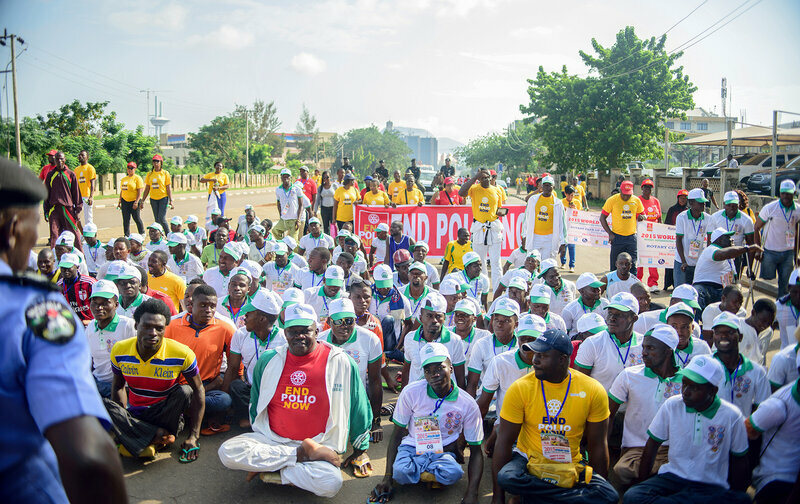 In honor of World Polio Day on Oct. 24, Rotary International invited para-soccer teams from around Nigeria to participate in a tournament in the capital, Abuja. 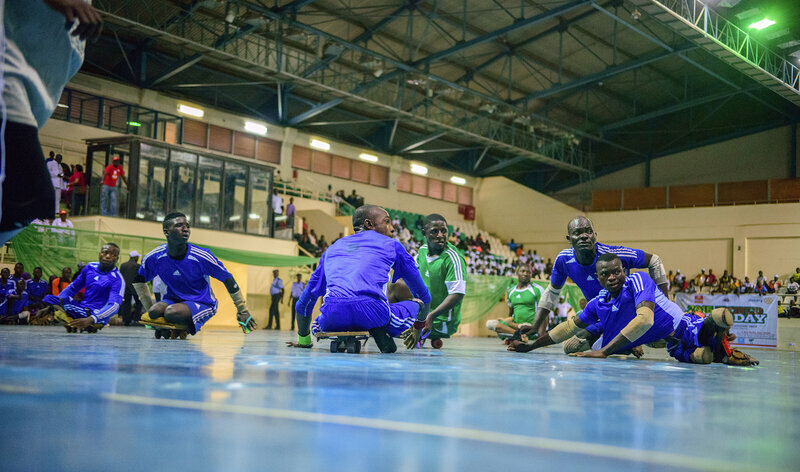 Nigeria&apos;s para-soccer league was formed to provide polio survivors with the benefits of a competitive sport — better health, more confidence and a physical and emotional outlet. To play, Muntari sits on a small wooden scooter — a twelve-inch wooden square with four swiveling wheels — which is how many polio survivors in Nigeria get around. Scooter users propel themselves forward by pushing their hands on the ground. Funsho says he&apos;s seen these teams play for years, but is always amazed by their athleticism. "The agility and the skill displayed is incredible," he says. Funsho hopes the league will play a part in changing people&apos;s attitudes about polio survivors. "We know for another half century at least, we are going to have people that have to live with the consequences of polio," he says. And he hopes the para-soccer league&apos;s growing profile will serve as a reminder of the continued threat of polio. Though no new cases are popping up in Nigeria, the disease can be harbored by people without symptoms — and can be transmitted through contaminated water and open sewer lines. Muntari is happy to be part of that mission. But his thoughts today are on his team&apos;s performance. They&apos;ve lost all of their games so far. "We are young, we are just building the team, we are lacking experience," he says. He hopes to recruit more players in Sokoto, return to this event next year — and make it to the finals. Given his history, he has reason to be optimistic. "We know the sky is our limit," he says.